Why Clean a Trash Chute? Many of our clients own or manage Section 8 housing properties. The Government (HUD) have REAC inspections and the trash chute must be clean for those inspections. Some of our clients are on a scheduled Preventative Maintenance programs and have the trash chutes cleaned bi-annually. Do residents start complaining about recurring colds, allergic reactions, watery eyes and foul smells in landings and hallways. This sparks the property manager to call us and quickly solve the issue. If you haven’t cleaned your chutes in more than a year, chances are it’s time to have your building’s loading doors, trash chutes and compactor areas cleaned. Cleaning trash chutes is a form of source air pollutant control. A trash chute cleaning by Sunburst Environmental will eliminate the source of bacteria, which causes the foul odor, and also eliminates a significant source of air pollution. Indoor air pollution is “the highest risk to human health among all types of environmental problems,” according to a 1990 Environmental Protection Agency report. And indoor air pollution levels are often ten times higher than those outdoors, according to the Air Conditioning and Refrigeration Institute. Disturbing smells are not only distracting, they also can be dangerous. According to the U.S. Environmental Protection Agency, poor indoor air quality can cause short-term problems such as irritation of the eyes, nose and throat; headaches; dizziness and fatigue. Long-term health problems can develop after years of exposure to harmful air pollutants. Indoor air quality affects those who live and work in airtight buildings. Cleaning trash chutes frequently will improve the air quality and reduce odor by removing the mold, bacteria, scrap food “goo” files, bugs and other items lingering inside the chute after trash disposal. “We had a REAC inspection coming up and needed to have our trash chute cleaned in Augusta GA. No one in the area would do the job and we sourced Sunburst Environmental in Atlanta Georgia. Needing the service completed within 2 days we expected a high-priced ticket. Sunburst understood our position and quickly provided a solution. Within hours they had the project completed and we quickly realized that we had a company that we could assign to several projects. We eliminated several tasks by finding a single company to service our 90 plus locations. What was once an ongoing daily headache to tackle is now solved with this multi scope of work company. Our owners and managers are pleased with the condition of all the services from Sunburst. If you need trash chute cleaning, drain cleaning, or pressure washing services we highly recommend Sunburst Environmental. 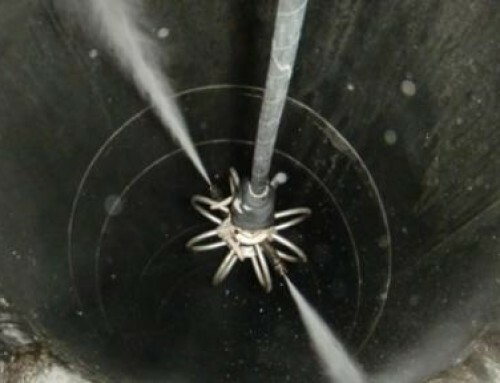 Sunburst Environmental has integrated hydro jetting technology into the trash chute cleaning process. We designed a process to clean the trash chute in your building with high volumes of water and custom designed nozzles that clean faster and better than the typical cleaning process. Our crews are trained with safety programs, cleaning procedures and equipment that others just don’t have access to. Our cleaning process will deliver a superior service. 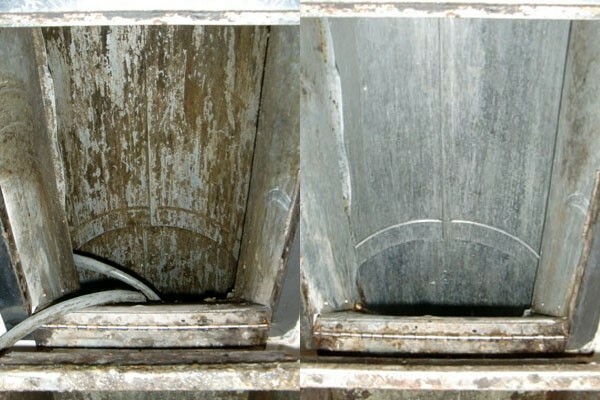 Before and After Every trash chute is a little different when it comes to the final cleaning results, chutes that have been maintained on a scheduled cleaning will provide a cleaner result. Chutes that have not been cleaned for years will show possible foreign materials that impregnated itself into the edges and or opening areas of the loading doors or other areas. With the pressure, we use we can remove more any foreign material associated with the chute area. It’s not a picnic to clean nor a place for one. We have crews executing the cleaning process with complete and documented safety measures strictly enforced. Each project is evaluated and a complete assessment is performed based on the complexity and size of your real property. Our approach includes the following processes: Preparatory, De-greasing, Hot Water Power Washing, Final Trash Chute Door Cleaning & Deodorizing, and Final Trash Room Cleaning with full service clean-up of floors and discharge area. As we discussed before, each trash chute is different and each trash chute cleaning assessment requires an approach that examines the trash chute condition and solutions needed to properly clean. After inspecting for obstructions, we check thickness of foreign materials estimate the timeframe since last cleaning and develop the solution to properly clean the area in question. We check all floors to verify that loading doors are working properly, place caution signs in the proper area, evaluate and cover the fire alarm and heat detector devices and conditions, water drainage conditions, make sure the residents have been notified of the cleaning time for the service and begin the degreasing process. In addition, we request that the building fire alarm system be placed in test mode as a lot of steam is generated from the 200-degree water that is used to power jet the trash chutes and other areas. We have had experience with fire alarms going off even with the protective covers in place. Once all items have been checked off in the prep process, we spray the selected combination of degreaser and enzymes that were pretested on the sides of the chute and on the inside of the trash chute door to break down loosen the collected grime. This will quickly break down, moisten, and loosen any foreign materials stuck-on the trash chute components for easier removal with the hot water power wash. Note: Rust cannot be removed during this process or the hot water washing process. Additional treatments are available for treating rust or other areas in need of repair. Ask us about these additional Trash Chute Cleaning Services. Mosmatic trash chute cleaning attachment for 24 to 36 inches. Once the cleaning process is complete, our trained technicians begins the final touch up cleaning and floor return process. This begins with the inspection of each floor trash chute loading area to confirm the area is clean and ready for customer inspection. All tape from the door intake joints, safety cones, signs or other materials used are removed. The technicians oil each door, wipes clean the trash chute door and sprays deodorizer into the chute leaving the door and opening as clean as possible. The technicians then apply a cleaning agent to the inside of the trash chute door. A second and final application of enzymes are sprayed on the inside of the door. Finally, the outside of the door is cleaned with stainless steel polish to obtain as much of the original door luster as possible. This process is repeated for every chute door. We service our clients with the best in equipment and water jetting technology, our trucks are equipped with 4000 and 6000 PSI hot and cold-water high pressured machines and hydro jetting machines used for pipe cleaning with jetter heads to get the job completed. The hot water temperature can be adjusted from 60 degrees up to 200 degrees. Once the trash chute is cleaned, deodorize and inspected our technicians focus on properly cleaning the bottom areas of the trash chute loading area. The technicians begin to pressure wash and clean all floors, walls or other areas that may have been effected by the trash chute cleaning. Any accumulated solid materials is bagged and properly disposed of. The technicians will use the right water pressure to assure no damage occurs to painted areas of floors or walls. If the scope of work requires the cleaning of a compactor we complete the compactor beneath the trash chute as well as the walls and floors immediately around the trash chute. All electronic equipment in any area of the trash chute, is protected with plastic sheeting. The trash room is left clean and all water is “squeegeed” to a floor drain located inside the trash room. As part of the trash chute cleaning we provide a hydro jetting service to the drains associated with the trash chute cleaning process. Our real property owners, managers and maintenance personnel are surprised at this additional step in our process but it makes sense since our technicians are trained hydro jetting experts. 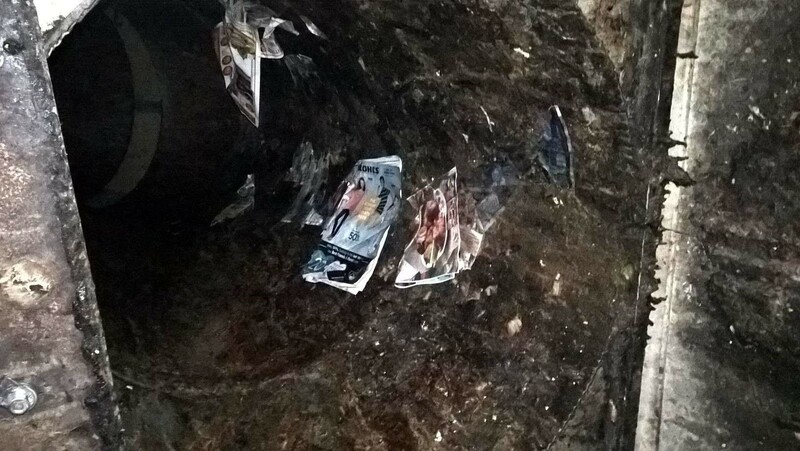 Sunburst Environmental and industry experts suggest that the trash chute is cleaned at the least on an annual basis. When large facilities have only a single trash chute or a large amount of residences using a chute, a frequency of twice per year is recommended. Sunburst can integrate your trash chute cleaning as part of your Commercial Drain Cleaning PM program. 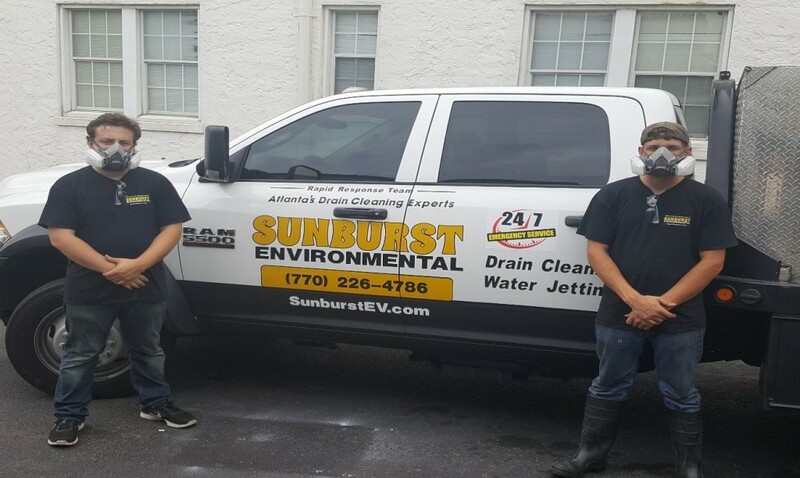 Sunburst Environmental is Atlanta’s Drain Cleaning and Trash Chute Cleaning Experts. If you’re in need of a professional company to perform this service rather than in-house building maintenance staff please contact us for a free estimate. Trash Chutes are very difficult to clean effectively without the right equipment as shown in the photos. We determine the estimated cleaning time once a company representative visits your projects location and performs the inspection to properly clean your trash chute. Typically, Once the setup is complete and all equipment is in place to start the project, our process will take 2-3 hours per chute depending on the height of the building, accessibility or other conditions that may be present. A 5 story condominium that has 2 trash chutes will require a total of 5 hours after setup to complete. Note: Depending on the condition of the trash chute time may vary. Chutes that have not been cleaned for long periods of time may need to be pretreated and or jetted several times to provide the best cleaning application. 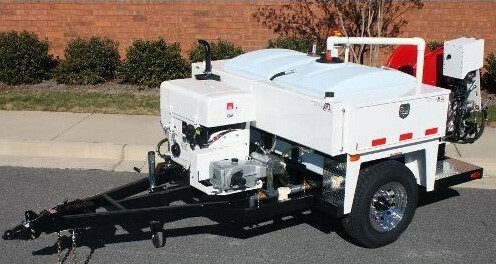 This is a Hydro jetting machine that we use for some projects that allow more water flow for better cleaning. These machines are equipped with 60 HP diesel engines that are fitted and design to deliver the same high pressure at the top floor as delivered at the lower level. Many vendors use equipment that loses pressure at greater distance resulting is less cleaning power.